Kooretza lays lovely light green blue eggs, and is the most regular layer we have. She's laid almost an egg a day since this latest round. The others all lay brown eggs, and unless there is a feather attached (and sometimes there is) we don't know who used the nesting box that morning. We've had chickens for about two years now. We got them solely for the eggs, and now we have them for eggs, their terrific compost, and the entertainment value. The first gang of Araucanas were good fun and laid beautiful eggs; however, we lost them in ones and twos. One simply died at the coop door (we buried her in the garden and she gave us some of our best tomatoes), two were hit by a car (we left them for the coyotes to clean up), and one was taken by a fox living in the nearby culvert. 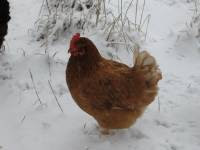 Koortetza survived, and we consider her possibly our smartest chicken. When we brought the new girls home, the pecking order needed to be established. Koortetza made it clear that the coop and the roost were hers, and they would do her bidding. One night there was such a commotion that I opened the roof to see what was happening. 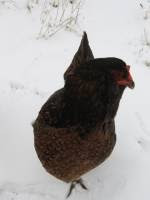 There I saw my girl, Koortetza, standing (literally) on top of Rhoda "discouraging" her presence on the roost. Like molting, this was a bit traumatic for all of us. 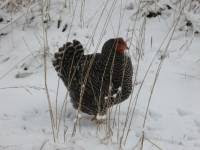 When we'd check on them before closing up the coop, we'd see Koortetza in her usual spot and the other three huddled at the opposite end of the roost. We suspected that the coming winter would make friends of them all, and so it did. As the temperatures dropped, the new girls inched closer to K. Finally, I found Rhoda snuggled under K's wing, and the others nearby. Peace at last.